More photos: of entire model and closer views. Click on the photos for high resolution pictures! The French corvette LA CRÉOLE was designed 1827 by engineer P. M. Leroux. On 5 May 1829 she was launched at the Cherbourg shipyard. She had a length of 39 m, width of 9,70 m, and was armed with 20 thirty pounder carronades and four eighteen pounder cannons. The crew were 150 men. A contemporary dockyard model of the ship today still stands in the Musée de la Marine in Paris. This ship model is implemented as partly rigged model here. The rigging stands up to the top of the lower masts. This allows for a clearer view on the deck. This very beautiful masterpiece model of the LA CRÉOLE is 1 : 36 scale. Length is 111 cm, width 27 cm, height 65 cm. 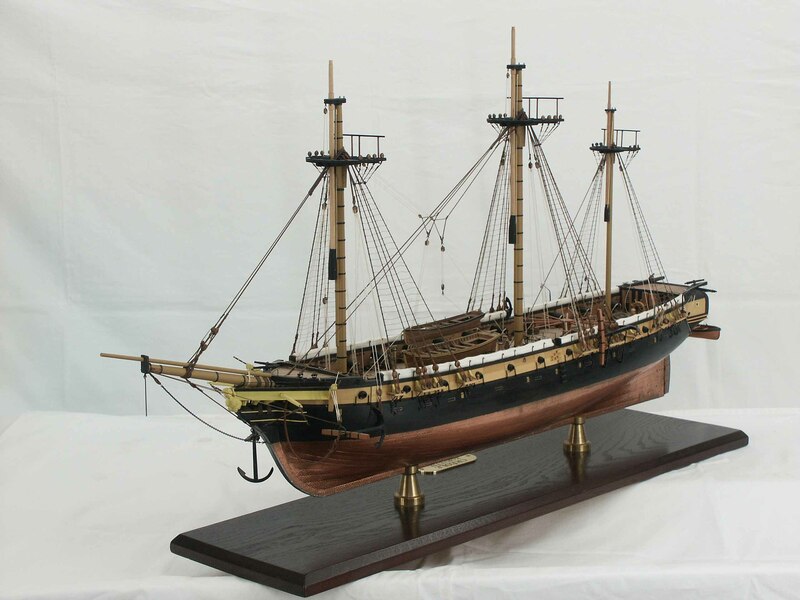 There is a set of photos, several views of the entire model and several closer views of hull and rigging.